NEW YORK (AP) — American adults rank steroid use among adolescents as less of a problem than alcohol, bullying, marijuana and sexually transmitted diseases, according to a study released Thursday that was co-commissioned by baseball’s Hall of Fame. Those polled also felt cocaine, obesity and eating disorders are bigger concerns. While 97 percent of the respondents believesteroids cause negative health effects, just 19 percent think steroid use is a big problem among high school students. “The results of today’s study show that steroids remain a mystery to the American public,” Hall President Jeff Idelson said at a news conference. The survey of 1,002 adults was conducted by The Gallup Organization from Oct. 9 to Nov. 10 and commissioned by the Hall, the Taylor Hooton Foundation and the Professional Baseball Athletic Trainers Society. “We have an adult population that is virtually oblivious to the fact that the problem even exists,” said Don Hooton, whose 17-year-old son Taylor — a cousin of former big league pitcher Burt Hooton — committed suicide in July 2003. Doctors attributed Taylor’s behavior to depression caused after he stopped using performance-enhancing drugs. While 63 percent thought steroids were a problem among professional athletes, just 46 percent thought it was an issue among college athletes and 17 percent among high school athletes. Hooton estimated the average high school in the U.S. has 25-45 students using steroids, which he said translates to an average of one per class. 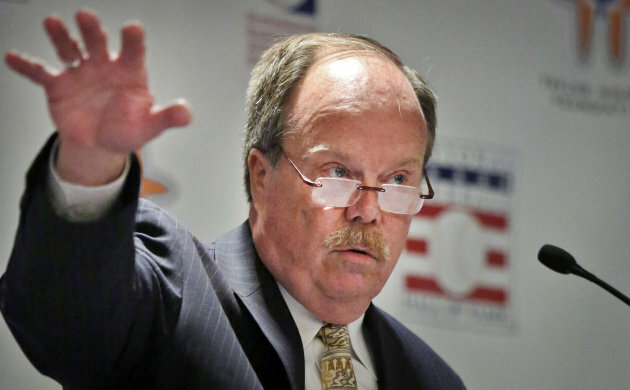 Don Hooton testified before the House Government Reform Committee during its 2005 hearings on drugs in baseball, and he faulted the politicians for their lack of follow through. Hooton said the federal government should launch an educational effort. While 75 percent of respondents in the survey favored mandatory testing of high-school athletes, when given an option 56 percent preferred education and just 44 percent testing. Hooton said testing likely is not a solution because of a lack of funds — Major League Baseball say the cost of a drug test under its program is $285. “If we don’t approach testing properly, we’re probably better off without testing,” Hooton said. Former New York Yankees head athletic trainer Gene Monahan, speaking for the Trainers Society, said youth are patterning their conditioning after the stars. The study was developed by the Center for Social Development and Education and the Center for Survey Research at the University of Massachusetts Boston, and it had an error margin of 4.3 percent. Hooton and Romano estimated 1 million to 1.5 million adolescents in the U.S. have used steroids, citing various studies. Gary Siperstein, director of the UMass program, wants the issue of steroid use addressed at early ages.